Timiro Theme Pokaż profesjonalizm Twojej restauracji wykorzystując UpMenu template. Daj się znaleźć klientom w internecie. Dodatkowo uruchom dopasowany do restaurant website online food ordering system i zwiększaj swoje zyski. A Template built for restaurants The Timiro restaurant website theme has been specifically designed to support restaurants. The simple CMS will help you adjust the website to the image of your restaurant as well as change the content. Thanks to the Timiro restaurant website theme you will create a really effective site in just moments, and you will earn immediate profits. Customers are looking for you on the internet, so let them find you. Bet on a professional image Thanks to the Timiro restaurant website theme you will build the image of a professional restaurant. The template design has been designed to showcase the best of its elements in just the right way. Use the interesting scrolling effects to show customers your dishes and interiors. Build a restaurant website that will present your restaurant as a unique place to eat. A Timiro theme for different types of cuisine With the Timiro restaurant website theme, you'll build a site that you can customise for different types of cuisine. The simple and elegant template design really does suit various types of restaurant. Present Asian cuisine and fast food in a great way. Or delicious burgers or fine dining for demanding customers. Create a restaurant website that will highlight the quality of your dishes and attract new customers. More orders in the restaurant The Timiro restaurant theme website is built to direct customers to your menu. Run an online food ordering system and earn more for food delivery and a takeout service. 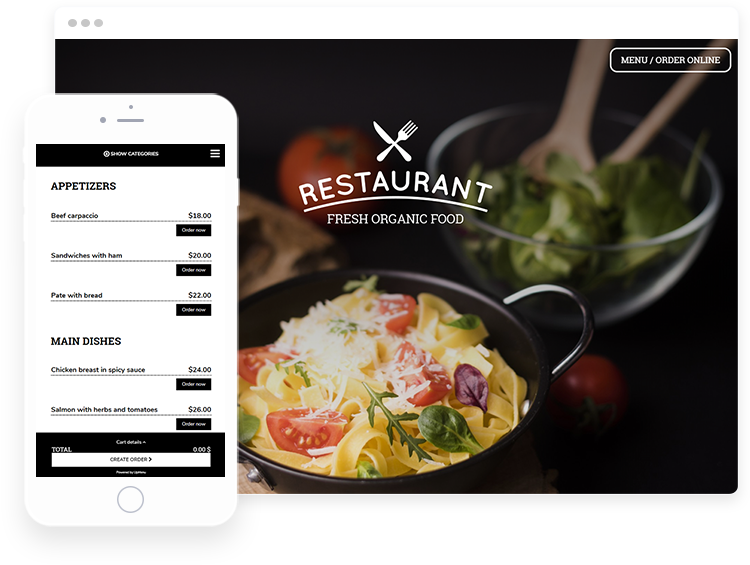 An intuitive layout and additional buttons support increased conversion of online orders to your restaurant website. Simply add online food ordering system to the menu tab and enjoy greater profits.